Limiting development and telling buyers about a home's true flood risk are among the recommendations by the Greater Houston Flood Mitigation Consortium. A new report by a group of leading Texas researchers details a variety of shortcomings with the Houston area’s current — and proposed — approach to flood control and calls on civil leaders to pursue a multifaceted and regional strategy that ensures that all communities receive better protection regardless of socioeconomic status. The report by the so-called Greater Houston Flood Mitigation Consortium — a group of scientists from universities and other institutions across the state formed just after Hurricane Harvey battered the region last August — says current regulations aimed at lessening the impacts of flooding are patchwork and often subpar, doing little to effectively corral floodwater. The consortium is funded by several major philanthropic foundations connected to the likes of Walmart and Kinder Morgan. “As greater Houston considers strategies and tactics for protecting residents from future storms, consortium members believe it is essential to acknowledge paradigm shifts that have occurred and to recognize that we are entering a new era in flood mitigation that will require bold thinking and actionable solutions,” the report says. It repeatedly stresses the effectiveness of limiting development in certain areas so grasslands can absorb flood water and ease stress on neighborhood drainage systems and the region’s vast bayou network — a recommendation sure to be met with stiff resistance in a famously pro-development region. The report also says there is a need to better inform the public through measures like a countywide flood alert system and homebuyer disclosures detailing flood risks. A 2016 investigation by The Texas Tribune and ProPublica explored how unchecked development has worsened the region’s flood vulnerability. The report’s release comes the day after the Houston City Council voted 9-7 in favor of stricter floodplain building regulations; starting Sept. 1, Houston homes built or significantly expanded inside a 500-year floodplain will have to be elevated 2 feet above the floodplain. The current standard is 1 foot above the 100-year floodplain, an area that is much more likely to flood. The vote came after a heated, hours-long debate in which conservative, pro-business council members expressed concerns about the impact to development and the economy. Developers and realtors opposed the rule, proposed by Houston Mayor Sylvester Turner. Turner has said more is needed to address flooding risks, and he has plans to push additional regulations. 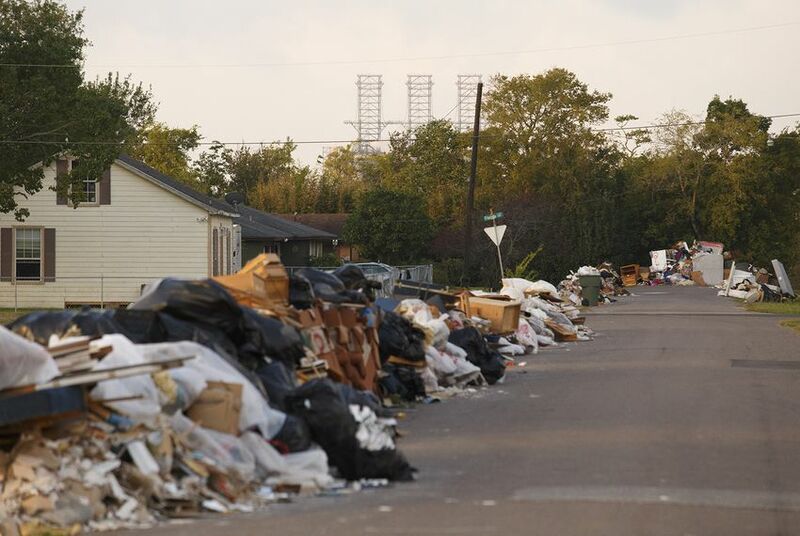 Harris County enacted similar floodplain building regulations months ago, but the report notes that the county is more limited in what it can do than the city, which has wide-ranging rulemaking authority. Still, such building regulations can only do so much on their own, according to the report, which acknowledges that political will — along with funding — will pose limitations. It is still unclear how billions in federal recovery dollars will be divvied up among storm-ravaged regions and which projects will be funded. One major Houston project state and local leaders have rallied around is the construction of another major reservoir. The report criticizes one version of that plan, saying it was designed to spur development and would not address any of the issues exposed by Harvey. It calls on the U.S. Army Corps of Engineers to provide more information on the condition and operations of two existing major reservoirs, known as Addicks and Barker, which filled to historic levels during Harvey. That spurred the Army Corps to release a deluge to ease stress on the 70-year-old dams, which are considered in poor condition although it is largely unclear how at risk they are of failure. The report is also critical of the current approach to buying out homes in flood-prone areas, saying an already expansive buyout program should be incorporated into a larger strategy that considers flood control infrastructure and opportunities to incorporate new parks, open space and housing stock. If buyouts are not incorporated into a housing plan, the report says the supply of affordable housing in the region — already too low — could further diminish. Poorer communities have already been impacted by cost-benefit policies that give greater weight to the value of homes that would be protected, the report indicates. And it brings up an issue that looms over the entire effort to protect Houston from future storms: Official floodplain maps have not proven to be a good measure of risk, casting doubt on the efficacy of any regulations on which they are based. Disclosure: Walmart Stores Inc. has been a financial supporter of The Texas Tribune, a nonprofit, nonpartisan news organization that is funded in part by donations from members, foundations and corporate sponsors. Financial supporters play no role in the Tribune's journalism. Find a complete list of them here.